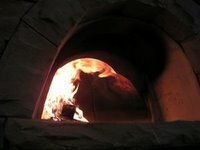 Using end-cuts and culls from the hickory flooring that we laid several months ago, I started the first fire in our pizza oven. Per the recommendations, I started the fire near the entrance tunnel. The first thing I noticed is that this oven design does not let a single puff of smoke into the living area. Wonderful! In fact, the only way that you can cause even a wisp of smoke to spill out of the oven tunnel is by removing the door too quickly or by blowing air into the oven... neither of which is ever necessary. Once the fire was well established, I pushed it further back into the oven and added some bigger pieces of hickory flooring. The pristine white ceramic dome began to turn black from the fire. Enthusiasm and excitement overcame caution and reason, so that within 30 minutes I had a raging fire going inside the oven. 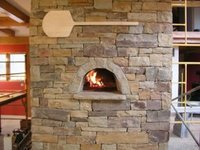 How is it that I could wait 2 years to build a house with a functional pizza oven inside, and yet could not find the restraint to follow a reasonable break-in protocol? Primal motivators like fire and hunger will do that to you! I moved the fire around in the oven to find the best place for it to burn. As expected, a nice fire in the back of the oven will shoot up flames that lick the dome of the oven and then make their way to the flue at the entrance tunnel (distributing heat nicely). But to my surprise, I also found that if you put the fire on the right side of the oven, flames will curve up the dome and come back down on the left side of the oven before swirling toward the entrance dome (left to right works as well). Although I made provisions for fresh-air makeup at the rear of the oven (via the ash dump), I found it totally unnecessary to provide more air to the fire -- plenty of air makes its way to the fire from the entrance tunnel. 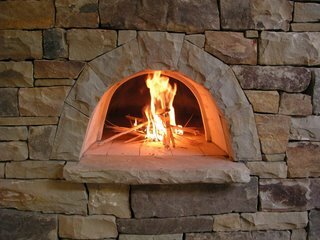 My wife showed up just as I was starting the first fire... more-or-less completely in shock that I was building a fire in the pizza oven even though our flue liners were barely level with the roof, the flashing wasn't done, and rain was coming in the house around the chimney! It took about 30 seconds for the look on her face to go from "have you gone completely mad" to "I'll run and get the stuff to make pizzas." A few words were exchanged, but they really weren't necessary! 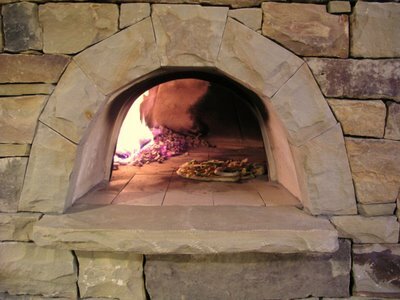 My advice for anyone contemplating a brick oven (indoors or outdoors) is this: whether you use the kit that I used or build-from-scratch, I would study the dimensions of this particular kit closely, because this thing works great. Its function has exceeded our expectations (smoke draw, easy of starting a fire, time to bring up to heat, cooking area, heat retention, etc.) . Previously, we wondered whether this oven would be a rarely used novelty or a serious cooking tool. No doubt, it is the latter!